Geek Lit Etc. : And you thought your college dorm-mate was bad. "What matters is that we're stuck with each other and we can't go back. 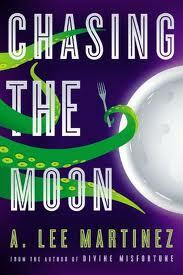 Me, a timeless devouring force, and you, a delicious chewy morsel wrapped around a crunchy calcium treat..."
So says Vom the Hungering to Diana, aka Number 5, in A Lee Martinez's Chasing the Moon. All Diana wanted was a cheap apartment. She was even willing to put up with that creepy landlord West when she found out the utilities were paid. Little did she know that the Apartment 5 came with a monster in the closet. Literally. An all-devouring creature from another universe named Vom the Hungering lived in the closet. And after she accepted the rooms, the only way out was to open the door to the hungering creature who can't help but eat everything in his path. With a self-refilling refrigerator and basic cable, she's also unable to age and nearly immortal. "Stay as long as you're able, Number 5. Leave whenever you're willing." But even after she and Vom strike something of a civil bargain, it's not like life can just go back to normal, albeit with a rather bizarre roommate. Now that she's seen the tears in the universe that most cannot, it's hard to go back to working retail at the mall. Besides, cosmic awareness has some rather interesting side effects that'll take a bit of getting used to. Not all creatures tuck in our universe are as good-natured as Vom, either.Oh, they mostly don't really want to cause trouble, and would much rather just go back to whatever universe they came from. It's just that these pesky Earth creatures are in the way of that. And what exactly is that big, green, tentacled thing in the sky? A Lee Martinez is a rising name in the world of humorous fantasy. He has the knack for putting everyday people into absolutely absurd situations, and yet they feel perfectly reasonable at the time. Add to that an ear for dialog and the ability to bring out the humanity in the most unhuman of creatures, and you get some of the most entertaining reading available. Highs: It seems so reasonable that these beings would have worshipers that it's almost a given that there'd be a doomsday cult with one at the head. Lows: I wish Diana had been able to gain a bit more insight after her trip to one particular other universe. Verdict: If this book, along with Divine Misfortune are indicative of his other works as well, I'd make him an author to pre-order.